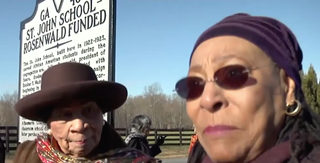 Alberta Brasfield (right) with her best friend, Bernice Mitchell, at the dedication of the historic marker at the St. John School in Albemarle County, Va.
An old school for African-American children in Albemarle County, Va., is finally getting the recognition it deserves some 93 years after it was built, WHSV reports. According to the news station, on Saturday a historic marker was dedicated in honor of the St. John School, which was built in 1923 through money from the Julius Rosenwald Fund to educate black children during a time of segregation. Former students of the school came out to participate in the dedication, recalling its significance back then. "It built the foundation," Alberta Brasfield, who attended the school with her best friend, Bernice Mitchell, recalled. "If this school wasn't here, we would've never learned to read and write." As WHSV notes, the school was closed in the 1950s and then nearly burned down after becoming privately owned. However, shortly after that, alumni became determined to revive the school, creating the nonprofit group St. John Family Life and Fitness Center, Inc. It took the group some seven years to get the school recognized as a historic site. "Those yet born will be happy to look at this marker and continue to be glorified as I am today," Mitchell said. "You apply for one of these markers and it's a competitive process," Marc Wagner from the Virginia Department of Historic Resources told WHSV. "The marker has to be a statewide significant topic." Now the group is focusing on raising money to restore life to the school as a fitness center.